There are two types of weight loss supplements – those looking to deliver quick results with stimulants and others that focus solely on natural-based ingredients. The latter ones can be helpful on a long-term basis and they also may promote overall health. One of those supplements is Turmeric & Ginger, which can do wonders for your overall health, and that will be the focus of our today’s review. 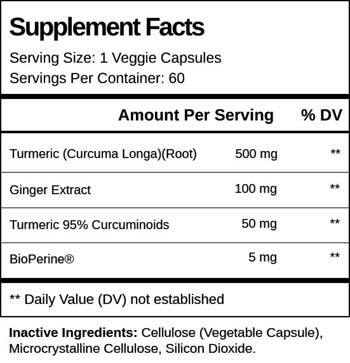 Turmeric & Ginger is a natural food supplement that can deliver numerous benefits. It is intended for people of all ages and genders who are looking for healthy ways to manage their weight while securing positive effects on their overall health. The product utilizes a superfood blend of two potent ingredients to help in promoting weight management, cognitive abilities, and a healthy inflammatory response. The supplement comes in the form of capsules and there is no secrecy when it comes to what is inside. The label clearly states the ingredients and their amounts, which confirms that the manufacturer focused on natural and plant-based ingredients. You do not need a prescription to purchase Turmeric & Ginger. Who Is the Manufacturer of Turmeric & Ginger? The company behind Turmeric & Ginger is called Vita Balance. Their headquarters are in Virginia, United States, but they also have a registered address in the United Kingdom. They have several products in their portfolio and they all aim to promote weight loss and management and overall health. Other supplements made by this company include Raspberry Ketone Plus, Green Coffee Plus, Colon Detox Plus, and Anti-Anxiety Plus. How Does Turmeric & Ginger Work? Turmeric & Ginger are compounds that you probably used as spices on at least several occasions. However, the manufacturer included generous portions of each of these superfoods claiming that they found the right dosage to secure multiple health benefits. According to the company, ginger may assist in curbing your cravings and hunger, which can support weight management. Another way the supplement might help in losing extra pounds is that it can stimulate your body to use sugars and fats as energy. The other benefits of the product include the potential to boost immunity and promote a healthy inflammatory response. Both superfoods have potent anti-inflammatory and antibacterial properties that may help in boosting overall health. Finally, the manufacturer claims that the supplement can also promote cognitive function and boost focus and memory abilities. Turmeric & Ginger Ingredients – Are They Safe & Effective? Other Ingredients include silicon dioxide, microcrystalline cellulose, and cellulose. All the compounds included are natural-based, which makes them entirely safe to use. What Are the Advantages of Turmeric & Ginger? What Are the Disadvantages of Turmeric & Ginger? 1 Q.How Should You Take Turmeric & Ginger? Ans.The recommended dosage is two pills per day with a meal. The manufacturer claims that you should take one pill in the morning and one in the evening for optimal results. 2 Q.How Much Is Turmeric & Ginger? Ans. You can purchase a single bottle via the official website for $23.95. It contains a 30-day supply of 60 capsules, but if you want to stack up, you can buy multiple jars at once. Two bottles are available at the price of $42.94 and the best deal is 3+1 bottle pack available for $63.96. What Kind of Reviews Are Out There for Turmeric & Ginger? Users from all around the world posted feedback after trying Turmeric & Ginger and it seems that a huge majority of them was delighted with the product’s effectiveness. Many customers claim that the supplement helped them lose extra pounds and they felt much better after taking the supplement for a couple of weeks. Others were happy that the product was capable of relieving their joint pain, while some even noticed that their focus and memory is sharper than before. 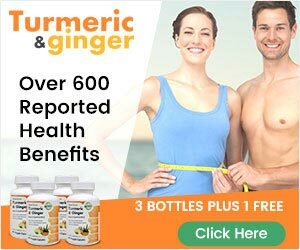 More and more people put time and effort into improving and maintaining their overall health and a superfood blend like Turmeric & Ginger can help with that goal. Whether you are suffering from pain caused by inflammation of looking for ways to enhance immunity, this product can be the boost you need. It also promotes healthy weight management and can assist in losing extra pounds as it has the potential to curb your appetite. The important thing to mention is that Turmeric & Ginger is an all-natural supplement. Its potent antioxidant properties can be beneficial for your organism is multiple ways and you are safe from any side effects. All these characteristics make this supplement one of those that should be given a shot as they can prove to be a valuable addition to your nutrition.